Hi - we currently use Topaz with Firefox - however, Firefox's latest update has disabled the plugin - We had to downgrade the Firefox upgrade to get it to work again. IS there another widget you can recommend that connects to a signing pad? People come into the fire hall to sign documents and handing them over a wireless mouse is not very professional. We really prefer a topaz type signing solution. The forms on our website are used by people wishing to do them from home, so signing with their mouse is working just fine. In addition, have you tried using Chrome browser instead and see if there is a working plugin there? we tried every browser and only Firefox works. We have sent an email to Topaz. 'I sounds like your web page implements SigPlusWeb, which is an NPAPI plugin that is no longer supported by any browser. HerCan someone at Jotforms please look into this? So many people use Topaz and the code on your end needs to be updated. I was able to reproduced the issue with the SigPlus widget not working on the form. I have submitted a bug ticket report to our higher team support so that they can take a look. We will let you know here once we have resolution available. It is SigWeb now, not SigPlusWeb with an outdated NPAPI plugin. Thank you for providing with the response from Topaz which has been received by our backend team. I see that the issue is already assigned to one of our development team members and marked as high priority. Though I cannot provide any ETA at the moment, you'll be updated here with any update we have from our backend team. We appreciate your patience and understanding. Thank you! How are we doing with the update for Topaz? Any idea when that will be updated? We are waiting patiently and have now resorted to using a manual system until you update the widget. Unfortunately, there is no update yet on this issue from our backend team. Let me send a note to the backend team to see if there is any update in this regard. You'll be receiving an update on this thread once the issue is fixed. We have made an update to see if it is working again. Could you please test it on your side? Thank you!! My IT person is in tomorrow (Wednesday) and we will try it then. I will give you an update without fail. We will try it on Edge, Chrome and Firefox. I was also still able to reproduce the issue on my end. I will make a follow up about it to our developer assigned on the ticket. 'It sounds like your web page implements SigPlusWeb, which is an NPAPI plugin that is no longer supported by any browser. Can someone at Jotforms please look into this? So many people use Topaz and the code on your end needs to be updated. We have notified our developer who is looking into this issue. As soon as we have any information in this regard, we'll update you here. This is disappointing since I brought this to your attention on March 17th - one month ago! We have been unable to use our forms when a property owner comes to our firehall as the Topaz signature doesn't work. You can only imagine how difficult it is for the property owner to try and use our 'mouse' to sign! Please - can you expedite this request? Hello Jocelyne - I understand the frustration, I truly do. Although we haven't heard back from our Developers yet, your thread is marked with a Very Important priority. Rest assured our developers are working on this and any updates we get from them will be posted on this thread. In the interim, I personally know how hard it is to sign using a mouse. Perhaps using a different signature widget is something you can consider. The 4 above are the most commonly used by many. I created this form so you can test the viability of using these widgets with a touchscreen device and a digital/stylus pen. Yes, it would be different compared with your existing workflow of using a physical Topaz Signature Pad, but compared with using a mouse, this would be rather easier for your users. Just open the form on a mobile phone, a tablet, or on a PC with a touchscreen monitor, use a digital/stylus pen to sign, and see if that will work as a temporary alternative while waiting for a resolution. I'll wait and hopefully your developers are working on this. It appears this is a problem for anyone using Topaz. Thank you for taking the time updating us on the status. We appreciate your patience and understanding on the matter. I did made a follow to our developer assigned on this bug ticket report already. Hopefully an updated response on the status will be available soon. I got an update from our dev assigned to the ticket. He mentioned that they are working with this in priority. So an update will be available soon. Additionally, I also just realized a mistake on my part (I truly apologize for that). I have been testing using the SigPlus widget on my test form but I haven't installed the *required plugin yet (it can be downloaded from here). 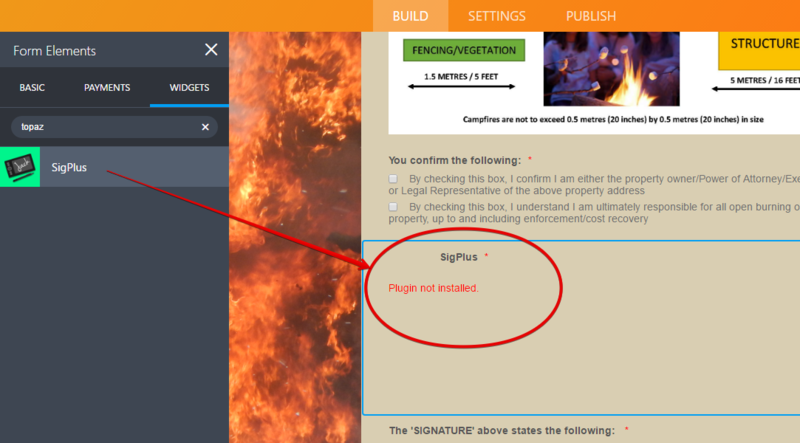 The plugin must be installed first also on the device before you can use the SigPlus widget on the form. Please make sure also that the plugin was indeed properly installed, with it not being installed could also be the reason the widget was not working as intended. Now do you understand the problem? Your link even says it is no longer supported!! I apologize for the confusion. Yes, we have relayed the info from Topaz to our dev assigned on the ticket as well. Let us just wait then for update from our dev. Hopefully its the fix by then. The fix will be live after testing. The update is live and I would love to hear your feedback on it. If it doesn't work or has some problems it will be great to attach some screenshots of them, since currently I don't have a signature device to test it throughly with. And then as soon as they start signing, the white signature box appears? (see second image) Does it do that at your end? Regardless - it is working and we are very happy!! Unfortunately, I still see the error Signature Tablet is not installed on my test form and your form as well. However, your message has been received by Alp. Let me send a note to check with him again on this issue. No No - its working!!!!! Please leave it be...not sure what you are seeing and my form is working?? Which one of my forms is telling you its not working? The loader is now removed. Can we make it better -e.g. by whitening the signature area-? At this point your comments are vital since I don't have a device to test the experience. Thank you Alp - all is good as is!! Appreciate the quick response and fix!